Many screens have I made, many. There is something irresistible about screens and they always seem to be necessary, just to have. Sure they're handy as room dividers, but to be honest, I've rarely seen them actually used specifically for that purpose. Screens are, in my experience, primarily a decorative accessory and unique one-offs. Extremely customisable, they're not even always free standing and are often utilised as feature wall panels. They don't take up much floor space and are efficient as movable room dividers. People just want them. I'm definitely one of those people and fortunately, I've been commissioned to make quite a few which is highly gratifying. This post documents some of the screens I've made which all date pre blog. Next ones I make I will most certainly be documenting the process of the making. It's all well & good looking at pictures of finished pieces but that entirely misses the best bit: the making of them and that's so my territory, stay tuned. 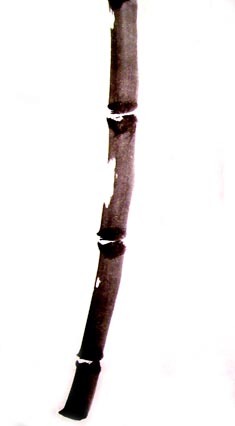 A four leaf screen, each leaf approx. 1750mm H x 445mm W.
Pine frame with MDF faces covered with a textured wallpaper, hand painted decoration. The screen shown here was actually an exception to the norm, commissioned as an office partition* device and subtly finished. *This screen was returned to me for caretaking when the office it was commissioned for moved location and I hope to keep it too, so expect it frequently turning up as a photo prop! So damn handy, screens. Pleasingly, I got to use a pet product: textured/embossed wallpaper. I bought this at a non-descript hardware shop in New Zealand (NZ for heavenssake? Why not?) and of course I've never seen it's like again, dammit. It's a rattan style weave, nice, but there's some fabulous ornately patterned styles around that are fabulous, I'll fit them into some future project, some time, you can bet on that. I wish I'd bought 100 rolls of this one though but alas, just the two and I used up most of those for this job. If you're interested, there are a quite a few textured embossed wallpapers around, usually found by searching "Anaglypta" or "Lincrusta" . According to this site, " Anaglypta is a Greek term meaning "raised ornament". These wallpapers have an embossed or textured that resembles fine plasterwork. Anaglypta wallpaper is white and it must be painted after hanging. Lincrusta is also a deeply embossed wall covering." So there you go. There are a few on my Pinterest "Making" board in fact. An internet search of "3D wallcoverings" will yield some interesting results too. The Banana Tree motif that I used for the above screen has been kicking around my studio for years, one of those happy finds in some waiting room magazine that yes, I tore out & saved for future reference. So, no original source reference available sorry, although I do believe it was shown in an advertisement for an American fabric house, but that's as far as I get. Now this magazine page stealing was maybe nigh on 20 years ago (my god). I did the sketch shown below at the time and yes, I kept that too, for all those years. Then I bides my times for a screen commission to come along that would suit, and bingo, one did and I pulled this design from the archives. Yep, it's still good, I still like it and I really wanna make it, I chortled! And then I got to do the fun bit: making it. The above sketch was done soooo long ago it was before computers & everything. Good old graph paper hey? Them were the days. To begin, this is a classic four leaf screen. The carcass construction was made for me by a very good cabinet maker, the best friends to have in this business; make sure to be nice and pay well for great work! A simple pine frame with a solid shaped piece (made according to a napkin sketch of proportions I was after) at the top, finished with a 3mm sheet of MDF on the face. All surfaces were sealed with acrylic paint and *wet sanded smooth. 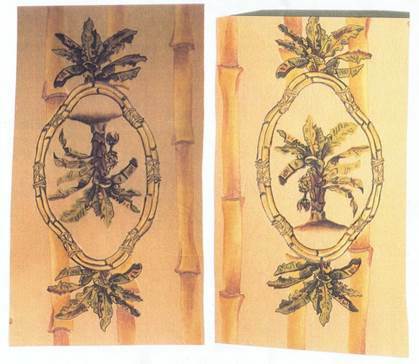 *Having decided on the banana tree/bamboo design, there was some debate as to what the background should be: the textured wallpaper with paint finish or plain gilded silver leaf. (Or gold! Or tarnished or patterned leaf! Indecisive clients!) Hence the wet sanded pale yellow painted base colour seen here. Otherwise a white primer would've sufficed. The Bamboo effect paint finish was amended from originally planned bold to very subtle, it would've been too much with the texture. To get the effect shown here I painted on a glaze of acrylic medium with a small amount of white pearlescent pigment added, dragged a wide flat brush down with 'stops' to gather the paint to create the joins. In fact it's so subtle it's apparent only on an oblique view and nigh impossible to capture in photographs. So not a dominant feature in the end, as with the 'Plea banners', in fact, they're discarded, but I did mock some up & blu-tack on, just to see...but nah. Although I did think it needed a detail at the bottom for balance and these Indian woodblocks oriental floral motifs did the trick. Keeping the colonial theme y'know. I also added a thin black line at the base, courtesy of some 3mm vinyl pin-striping tape I once picked up somewhere. Some available here in lots of pretty colours too. I projected the central banana tree motif image directly onto the screen (via an old timer overhead projector) and used this as a general guide for scale & position. It's too difficult in some conditions to get any clear detail accuracy this way, so it was really a matter of free hand drawing with a fine brush, working from the original small magazine picture taped up in front of me. I used Jo Sonja brand artist's acrylics, a mixture of dark gold, pale gold, white pearl, burnt umber and carbon black. The rear of a screen is traditionally either blacked out (as they're seldom used as functional room dividers) or given minimal decorative treatment, the focus usually being on one side in most cases. This screen found a compromise: a reasonably plain back that offers an additional function. The handy-dandy pin-board of course, creating a useful informal office space divider. All in all, this screen works well for purpose. It's not overly decorative and is suitably non-distracting for an office environment. The subtle pearlescent paint effect and texture & small, interesting decorations on the front faces, along with the practical but stylish finish to the reverse side all work well, given that this screen's primary function IS as an office partition. Industrial acoustic fabric over foam board, trimmed with cotton piping cord. The following images are of screens I've made, commissioned by certain 5 star hotels/resorts for public area displays or private residences. All are constructed from MDF board and use a combination of painting & gilding with chemical oxidising. Large gilded & painted screen. Made in collaboration with a team of artists, it features custom made gilded resin corner details & bronzed brass feet. A cracked leaf finish on border and hand printed decorative patterns over chemically oxidised leaf on central area. Apologies for quality of image, a copy of a copy etc. Wall mounted painted screen. Acrylic on MDF panels. Imagery inspired by C19th Australian landscape paintings. Wall mounted four panel screen. Chemically treated layers of metal leaf on dark red base colour. Wall mounted four panel screen. Chemically treated layers of metal leaf with pale green base colour. Wall mounted four panel screen. Chemically treated layers of metal leaf on near-white base colour. IMAGES BELOW SHOW SAMPLES MADE ON THE DAY TO TEST THE CHEMICAL'S STRENGTH. 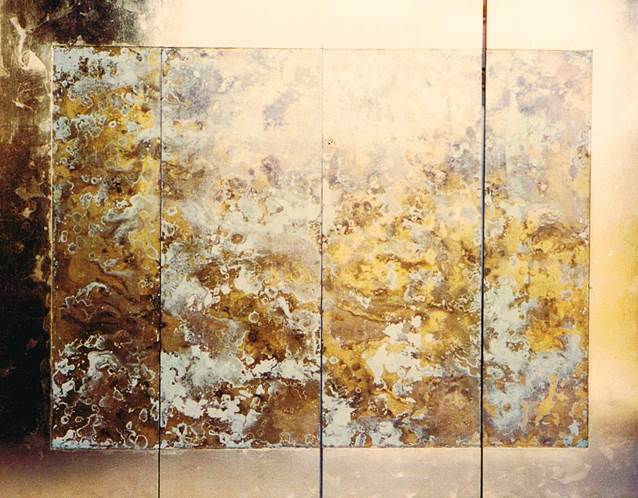 Large pure silver leaf screen commissioned for bedhead, private residence. DETAIL OF TRAIL SAMPLE; layers of metal leaf laid on orange base which is exposed by selective chemical deterioration. Regarding the treatment of metal leaf with chemicals, it's a Fine Art, no joke. At the time of making these artworks I was getting pretty good at it, but every time is a creative risk rush, if you know what I mean. It's like cooking, very much in fact; one can have all the same ingredients and recipe every time, but equally, it's in the hands of the gods every time too. Different batches of leaf, different atmospheric conditions, (rainy days change everything) microscopically different volumes of chemicals, even the mood of the One Who Wields the gear, are all critical factors with a bearing on the results obtained. Having said this, there are only a few ingredients required, these being leaf (although what size is used matters even) and chemicals; all the above and the following works were made using a combination of aluminium and Dutch Metal (imitation gold) leaf. Chemicals involved include aluminium chloride, cupric nitrate, potassium sulphide, barium sulphide, sodium sulphide and ammonia latex. That and respect for the gilding gods. My approach to this kind of work stems from my sculpture background; I see these finishes as patina and the surfaces like that of a sculptural object. The aim is not to produce a uniform wallpaper effect, but to be more of a dialogue between the materials; their reactions to each other, exposure to differing conditions and TIME. All art is about time, I came to realise, many years ago. The basic reference I learnt from and highly recommend is Jennifer Bennell's Masterstrokes. She covers the basics of what chemicals do what to what. 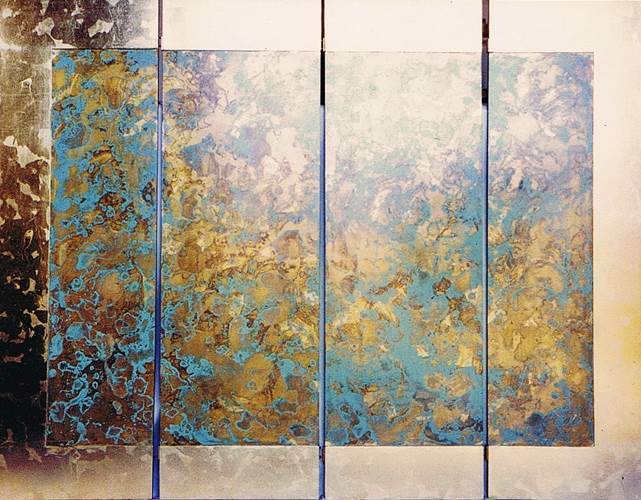 Producing gorgeous patinas on metals is a rich area of study for sculptors. Much of what each artist learns through time & experience is jealously guarded specialist knowledge, but there is much to be gained from anecdotal information and can be found now in online forums such as sculpture.net/community. From there, it's all down to experience, or as I like to say, 'bitter experience', and that's the truth. Often, the best results are a happy accident. But relax, this is fun! And there's only one way to find this out: yep, just do it. Four leaf wall mounted screen. 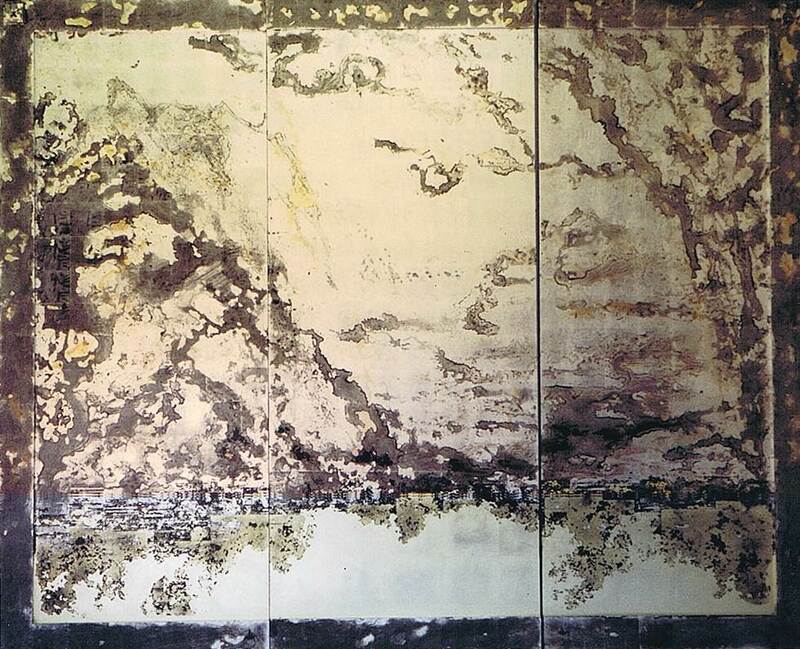 Border is a painted crackled lacquer. Center field, chemically oxidised meatl leaf exposing orange painted base colour. The black & orange crackle border frame is another chemistry process which involved an acrylic topcoat that is very sadly no longer produced. The following two images are both large wall mounted screen panels. The border is oxidized leaf with a hand printed pattern over, the center fields are decorative abstract Chinese calligraphy characters in dark blue paint, over a deep red base colour/abstract characters in bright blue on a deep yellow/orange base colour, revealed by chemically oxidized metal leaf. Each corner features gilded resin custom made roundels. These artworks were commissioned by a major South East Asian hotel for their presidential level feature artwork. Making screens requires a high level of finish and attention to detail and each one has it's own identity. They are both a household item and an artwork, a unique combination of qualities that makes them both accessible yet covetously special. Screens are prized decorative items that never go out of style and are always in demand; I look forward to my next one/s! Very large screen wall panels. The border features a hand printed pattern over aged leaf and abstract Chinese calligraphy characters are seen under the chemically treated metal leaf on the center fields. Custom made gilded resin bosses at corners.